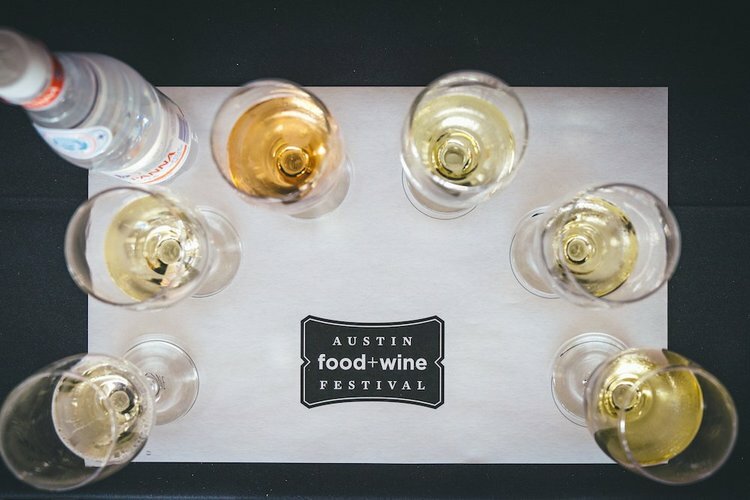 Deets: Austin Food and Wine Festival includes food from 50+ top restaurants & chefs, cooking demos with today’s most well-known, nationally-acclaimed chefs, guided tasting sessions from master sommeliers, mixologists, winemakers and brewmasters, and bites hot off the grill at the live Fire Pit, served by experienced pitmasters. Deets: What if a child from another world crash-landed on Earth, but instead of becoming a hero to mankind, he proved to be something far more sinister? With Brightburn, the visionary filmmaker of Guardians of the Galaxy and Slither presents a startling, subversive take on a radical new genre: superhero horror. In theatres May 24, 2019. 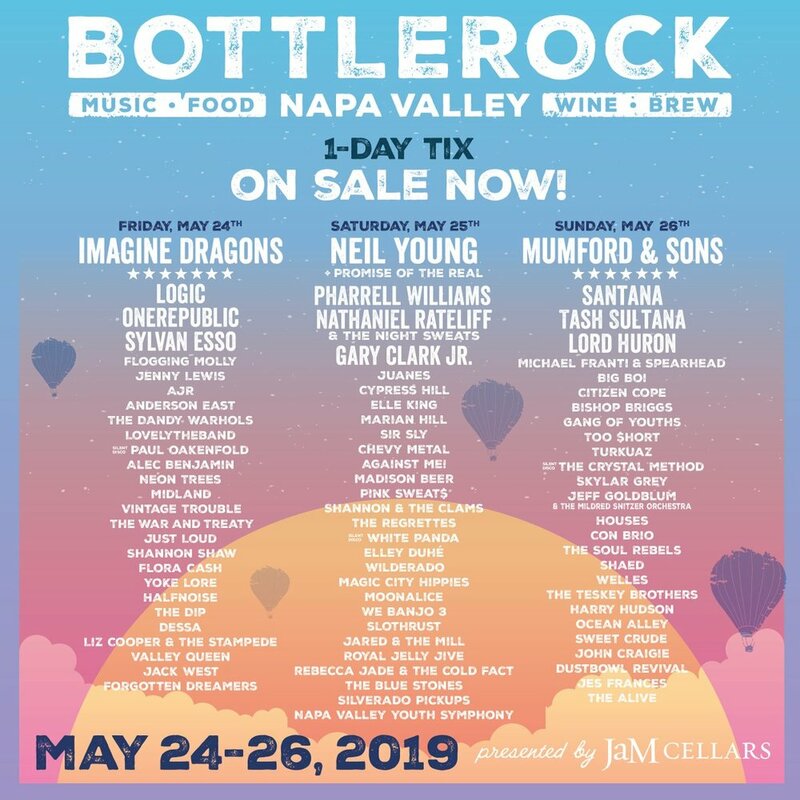 Deets: BottleRock Napa Valley 2019, presented by JaM Cellars, announces its seventh annual festival lineup today, which includes headline artists Mumford & Sons, Imagine Dragons, Neil Young + Promise of the Real, Pharrell Williams, Santana and Logic. The three-day music, wine, food and craft brew festival will take place in the heart of the City of Napa at the Napa Valley Expo, May 24 - 26, 2019. 3-day festival passes go on sale at 10AM PST on Tuesday, January 8, 2019 at BottleRockNapaValley.com. Single-day passes will go on sale at 10AM PST on Thursday, January 10, 2019.
Who You May Spot: Imagine Dragons, Neil Young, Mumford & Sons, Pharrell Williams, Logic, One Republic, Santana, Tash Sultana, and more! 3-day and VIP tickets are sold out! Sold out tickets are available now our official ticket exchange. 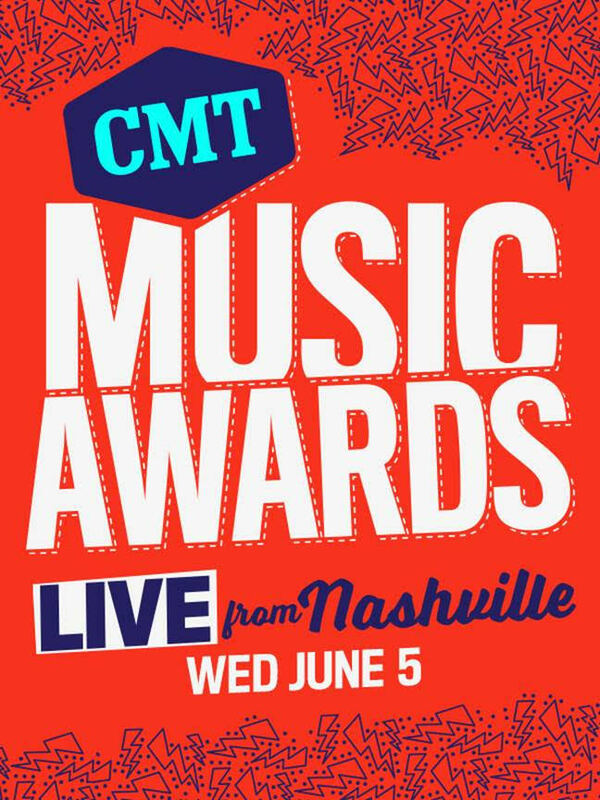 Deets: The 2019 CMT Music Awards will return live from Nashville on Wednesday, June 5th, with country music’s biggest stars. The CMT Music Awards honor the best, hottest and most inspiring country music videos of the past year. They're also distinguished for being the only fan-voted awards in country music, with voting open online at cmt.com. Who You May Spot: Chris Stapleton, Kelsea Ballerini, Black Shelton, Florida Georgia Line, Little Big Town, Reba McEntire, Luke Bryan, Carrie Underwood, and nominees to be announced in May. Hint For The Average Socialite: Tickets sales to be announced. The awards will also air live on CMT. Join Our Members Only Site for Info on How to Attend. 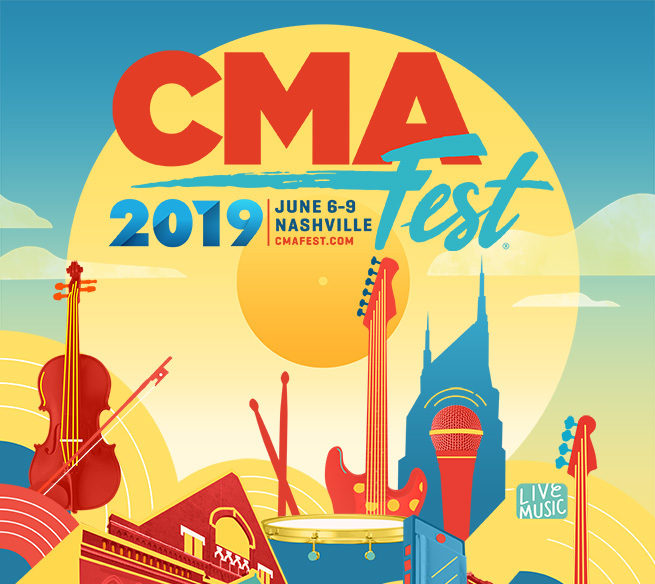 Deets: Back for a third straight year, CMA Fest has revealed the lineup for the popular nightly concerts at the Firestone Country Roads Stage at Ascend Amphitheater Thursday, June 6 through Saturday, June 8, with performances starting at 6:30 PM/CT each evening. Who You May Spot: Taking the nightly Nissan Stadium stage this year are Country Music superstars Kelsea Ballerini, Dierks Bentley, Brothers Osborne, Kane Brown, Luke Bryan, Luke Combs, Dan + Shay, Florida Georgia Line, Miranda Lambert, Little Big Town, Tim McGraw, Maren Morris, Old Dominion, Pistol Annies, Rascal Flatts, Thomas Rhett, Carrie Underwood and Keith Urban. Returning for a third year, the Budweiser Forever Country Stage will take place from 11:00 AM-4:45 PM daily. Featuring some of the biggest names in Country Music from recent decades, this year’s lineup includes Keith Anderson, Deana Carter, John Carter Cash, Joe Diffie, George Ducas, Charles Esten, Andy Griggs, Halfway to Hazard, Ty Herndon, Honky Tonkin’ with Tracy Lawrence, Little Texas, The Marshall Tucker Band, Kendell Marvel, Neal McCoy, Montgomery Gentry, Lorrie Morgan, Matthew and Gunnar Nelson, Jerrod Niemann, Jamie O’Neal, The Road Hammers, Ray Scott, Shenandoah, Sister Hazel, Ricky Skaggs, Kiefer Sutherland, Thompson Square, Uncle Kracker, Mark Wills, Rita Wilson and Darryl Worley. Hint For The Average Socialite: Tickets are required for entry, with three-day reserved tickets selling for $66, single-day reserved for $25 each night and single-day lawn selling for $10 per night, plus taxes and fees. Fan presale begins Wednesday, April 17 at 10:00 AM/CT and closes Thursday, April 18 at 5:00 PM/CT, with public on-sale opening Friday, April 19 at 10:00 AM/CT. Tickets can be purchased at CMAfest.com or Ticketmaster.com. Join Our Members Only Site to Learn How to Step Up Your Festival Fashion! Deets: The Essence Festival, known as "the party with a purpose", is an annual music festival which started in 1995 as a one-time event to celebrate the 25th anniversary of Essence, a magazine aimed primarily towards African-American women. This year we're celebrating our 25th Anniversary Essence Festival with 25 special experiences across four days of entertainment, empowerment and community! Don’t miss your chance to witness legendary performances. Plus, get in on never before seen musical collaborations in celebration of 25 years of #ESSENCEFEST! Who You May Spot: Missy Elliott, Mary J. Blige & more! Check out the full lineup! Deets: Having spent most of her life exploring the jungle with her parents, nothing could prepare Dora (Isabela Moner) for her most dangerous adventure ever – High School. Always the explorer, Dora quickly finds herself leading Boots (her best friend, a monkey), Diego (Jeffrey Wahlberg), a mysterious jungle inhabitant (Eugenio Derbez), and a rag tag group of teens on a live-action adventure to save her parents (Eva Longoria, Michael Peña) and solve the impossible mystery behind a lost city of gold. In theatres August 2, 2019. Deets: The 54th ACM Awards, hosted by Reba McEntire will feature live performances from some of the biggest names in country music and a medley of collaborations at the event deemed Country Music’s Party of the Year. In addition to the night’s honors, the Academy will host a slew of events including ACM Stories, Songs & Stars, ACM Topgolf Tee-Off and the ACM Awards Official After Party, all set to take place during The Week Vegas Goes Country. Who You May Spot: Reba McEntire, Chris Stapleton, Dan + Shay, Kacey Musgraves, Dierks Bentley, Osborne Brothers, Florida Georgia Line, and more! Hint For The Average Socialite: Purchase tickets here. Deets: HAMILTON: THE EXHIBITION - a 360-degree, immersive exhibit that will travel to select U.S. cities - has set a new opening date of April 6, 2019 in Chicago, it has been announced by Jeffrey Seller, producer of the musical HAMILTON. HAMILTON: THE EXHIBITION - on display in a specially-built free-standing structure the size of a football field -- opens this spring for a limited engagement on Northerly Island in Chicago, where HAMILTON has played a sold-out run since 2016. Producer Seller says, "HAMILTON: THE EXHIBITION is one of the most thrilling and ambitious projects of my career. As we continued to develop the experience over the last three months we were presented with both exciting new opportunities and unique challenges, the combination of which have led us to postpone the opening. In short, we need a little more time to get this right!" Featuring an audio tour narrated by Mr. Miranda, HAMILTON: THE EXHIBITION is designed to take visitors deeper into the life and times of Alexander Hamilton, while at the same time chronicling the American Revolution and the creation of the United States of America. With a dynamic, interactive mix of in-depth scenography, lighting, sound, multimedia and music, HAMILTON: THE EXHIBITION will give visitors an experiential journey from Hamilton's childhood in St. Croix to his untimely death in Weehawken, New Jersey and the numerous, indelible ways Hamilton's bold actions over 200 years ago affect our lives today. Mr. Seller previously stated, "I hope to use this exhibition to answer some questions that the musical doesn't address, like 'What did Alexander actually do when he was a trader in St. Croix What did Hamilton's Manhattan look like How did we win the battle of Yorktown ' In an environment that is visually stunning, aurally thrilling and ingeniously educational, we aim to give visitors yet another unique portal through the life of Alexander Hamilton into the American founding." HAMILTON: THE EXHIBITION is a collaboration between creative director David Korins, who designed the set for HAMILTON, Yale University professor and historian Joanne Freeman, HAMILTON creator Lin-Manuel Miranda, director Thomas Kail and producer Jeffrey Seller. Harvard University history and law professor Annette Gordon-Reed is also contributing to the historical accuracy of the exhibit. IMG joins the team as project manager for the exhibition. IMG's exhibitions team organizes and produces world-class experiences that have captivated more than 30 million visitors at the finest art, science and history museums worldwide. Its principals have been entrusted with priceless world treasures from land and sea, including relics from Cleopatra's Royal Palace and Pompeii, Princess Diana's Royal Wedding Gown, and the only authenticated pirate treasure in the world. Its new blockbuster King Tut: Treasures of the Golden Pharaoh, the largest exhibition of artifacts from the pharaoh's tomb ever to leave Egypt, recently debuted in Los Angeles. HAMILTON: THE EXHIBITION is the most recent extension of HAMILTON, the musical, following the release of "Hamilton-The Revolution," the best-selling book about the making of the musical; the Hamilton original Broadway cast recording, now double-platinum and streamed over two billion times; the HAMILTON MIXTAPE, which features leading pop music stars performing covers of songs from the musical; "Hamilton's America," the PBS documentary; the HAMILTON APP, which has already had more than 1 million downloads since its launch late last year; and HAMILDROP, Mr. Miranda's series of newly-recorded covers of songs from the musical. As well, HAMILTON has created an innovative, nationwide education program about the Revolutionary War, EduHam, available to hundreds of thousands of Title 1 high school students. HAMILTON will open in San Juan, Puerto Rico in January 2019. Hint For The Average Socialite: For more information and to sign up to be the first to receive news and ticket sales alerts about HAMILTON: THE EXHIBITION, please visit hamiltonexhibition.com! Deets: Based on the seminal horror novel by Stephen King, (#StephenKing) #PetSematary follows Dr. Louis Creed (Jason Clarke), who, after relocating with his wife Rachel (Amy Seimetz) and their two young children from Boston to rural Maine, discovers a mysterious burial ground hidden deep in the woods near the family’s new home. When tragedy strikes, Louis turns to his unusual neighbor, Jud Crandall (#JohnLithgow), setting off a perilous chain reaction that unleashes an unfathomable evil with horrific consequences. Deets: Las Vegas’ highly anticipated speakeasy bar and grooming salon, The Barbershop Cuts & Cocktails, will host its grand opening weekend starting on Friday, March 15th at The Cosmopolitan of Las Vegas. Clique Hospitality partners Ryan Labbe, Jason Craig and Andy Masi, will once again make their mark in Las Vegas with the premiere of its new modern, experiential barbershop and speakeasy. Friday night will feature a special headline performance by Gavin Rossdale’s Bush. Following grand opening weekend, the venue will continue to roll out artist alignments and performances across all music genres. Attendees are in store for an unforgettable weekend of live entertainment and festivities kicking off Friday. “This is a concept we have been wanting to do on the Las Vegas Strip now for sometime. We’re extremely excited and honored to have the opportunity to create such a unique venue space,” says Jason Craig, Clique Hospitality partner. A throwback grooming parlor by day, The Barbershop will be led by master barber Jose Sosa and his nationally renowned grooming team. With appointments available online and walk-ins welcomed, guests can kick back in a barber’s chair for a classic cut, beard trim or straight razor shave. On Friday night, guests will step into The Barbershop through an unassuming janitor’s door, where they will be led into a swanky hideaway speakeasy that harkens back to the Prohibition-era. That evening, guest will be treated to an intimate performance by the iconic band Bush, led by Gavin Rossdale. The epic weekend will continue on Saturday night with the debut of The Barbershop’s house band The 442s. After years of touring with Lifehouse, Vertical Horizon and Savage Garden, guitarist Ben Carey, joins singers Justin Carder and Shawn Eiferman, bassist Eric Runquist and drummer Chris Lukes to form The 442s. Saturday night will mark their band’s official debut as they take the stage for an electrifying performance. Following the grand opening weekend, guests can expect even more exclusive live performances starting with Dennis Quaid & The Shark’s rock 'n' roll / country-soul sound on Friday, March 22nd followed by the R&B sounds of Robin Thicke on Saturday, March 30th. Weekly programming will also kick off with Tuesday night Rockstar Karaoke debuting on March 26th, DJ Programming on Fridays, and a live band every Saturday, offering patrons a comfortable, VIP vibe for an experience far from your typical Vegas night out. The Barbershop’s showpiece, a Mahogany bar originating from the 1800s, will boast a curated barrel-aged whiskey selection ranging from American, Japanese, Irish and Canadian whiskeys to bourbons, scotches, craft beer and other sipping spirits including tequila, mezcal and champagne. The Barbershop Cuts & Cocktails is located at The Cosmopolitan of Las Vegas at 3708 S Las Vegas Blvd, Las Vegas, NV 89109. The Barbershop is open daily from 10 a.m. - midnight and the bar is open Tuesday - Saturday 5 p.m. to close. Follow The Barbershop Cuts & Cocktails on Instagram @TheBarbershopLV. The debut of The Barbershop Cuts & Cocktails will join Clique Hospitality’s notable namesake hotspot at The Cosmopolitan, which debuted in 2015, CliQue Lounge. Clique Hospitality was founded by Andy Masi, a visionary who has helped changed the dining and nightlife landscape of Las Vegas since 2001. Masi dedicated his life to making guests feel that a simple night out was more than just a memory, but also an experience. A boutique hospitality company with operations in Las Vegas and San Diego, Clique specializes in upscale, comfortable dining that sets trends, rather than following them. In its partnerships with many of the world’s biggest corporations, including MGM Resorts International, Pendry Hotels, Station Casinos and The Cosmopolitan of Las Vegas, Clique is transcending hospitality through service and operations, unabashed cuisine, appeasing design and unrivaled desire. For more information, please visit https://cliquehospitality.com. Located in the Heart of The Cosmopolitan Las Vegas, The Barbershop Cuts & Cocktails is a new modern, experiential barbershop and speakeasy from Clique Hospitality’s Andy Masi and partners Ryan Labbe and Jason Craig. Guests will throwback to an era in which one’s appearance was as strong as their opinions. Upon entrance, gents can kick back in a barber’s chair for a classic cut, beard trim or straight razor shave, all under the helm of master barber Jose Sosa and his nationally renowned grooming team. While enjoying their services, guests are invited to sip and enjoy a complimentary selection of fine-aged whiskeys and beer available for pour. In the evening, The Barbershop Cuts & Cocktails takes on a different persona. Behind the unassuming janitor’s door in The Barbershop is a swanky hideaway bar that harkens back to the Prohibition-era featuring weekly programing, DJ sets and an extensive whiskey selection, offering modern takes on vintage favorites. For more information follow The Barbershop Cuts & Cocktails on Instagram @TheBarbershopLV. The Cosmopolitan of Las Vegas is a unique luxury resort and casino that offers a decidedly different perspective. Located in the heart of the Las Vegas Strip, The Cosmopolitan’s distinct vertical multi-tower design features more than 3,000 guestrooms with residential living spaces, private terraces and breathtaking views of the city skyline. Luxury amenities include a premier lineup of world-class culinary experiences; an intriguing mix of bars, nightclubs and entertainment venues; 100,000-square-foot-casino; award-winning spa, salon and fitness center; unrivaled pool district and an eclectic line-up of hand-selected boutiques. For more information visit: www.cosmopolitanlasvegas.com. Spotted: Gavin Rossdale and BUSH Performed for VIP talent guests including Gilles Marini and wife Carole, Trace Cyrus and Fiancee Taylor Lauren Sanders, Samuel Larsen, AnnaLynne McCord, Rachel McCord, Diana Madison, Philip Boyd, Ballers' Carl McDowell, and more plus The Barbershop's owners, nightlife partners Andy Masi, Jason Craig and Ryan Labbe of Clique Hospitality. Other industry vips such as Jeff Beacher, Larry Rudolph and more stopped by to join in the festivities at the intimate speakeasy. Guests enjoyed a live performance by the iconic rock band BUSH, and Angel's Envy whiskey at their VIP tables. Hint for the Average Socialite: For reservations click here! Deets: Super Bowl LIII, the 53rd Super Bowl and the 49th modern-era National Football League championship game, will decide the league champion for the 2018 NFL season. The game is scheduled to be played on February 3, 2019, at Mercedes-Benz Stadium in Atlanta, Georgia. Hint For The Average Socialite: Join Members Only for sweeps, & other ways to Attend. Deets: ChefDance returns to Park City during the Sundance Film Festival for its 16th year of culinary celebration. Five nights of decadent eats, courtesy of the world’s most skilled chefs, live performances, notable company, as well as the most prominent films. This year, ChefDance has collaborated with Postmates, Sysco, Beam Suntory, Proud Source Water, Cisco, Antica Wine, Shiseido, NUGL, Game Loft, as well as Future Generations Now and Operation Smile as the official charity. In 2004, ChefDance founders and LA couple, Kenny Griswold and Mimi Kim, launched the first ChefDance to provide the perfect marriage of fine food and film. Today, ChefDance is one of the most highly acclaimed culinary event series bringing the country’s best chefs together during the Sundance Film Festival’s most acclaimed actors by hosting lavish dinners paired with specialty cocktails. Sundance Film Festival takes place every year in Park City, Utah. The festival has grown into one of the world’s most prestigious film festivals and has emerged as a focal point for the entertainment industry, as well as film enthusiasts around the globe. Last year’s festival attracted over 70,000 people, and reached millions more worldwide through extensive media coverage. ChefDance events are held in the Memorial Building located at 427 Main Street in Park City on January 25th through January 29th. Rooted in the principle of “Inviting Great”, ChefDance welcomes celebrated guests, companies, and chefs to indulge in fine food and culture, alongside film enthusiasts in an exclusive setting that promises great experiences, great connections, and unforgettably great moments. A ChefDance invitation has become the most coveted ticket during the Sundance Film Festival. Each evening, a world-renowned celebrity chef will create a gourmet menu for a diverse group of guests, which includes the cast and crews of the festival’s top films. With the 2019 Chef roster as robust as ever, guests have the privilege of basking in the creations of Chef Casey Lane (Viale Di Romani, West Hollywood), Chef Jessica Koslow (Sqirl, Los Angeles), Chef Paul Qui (James Beard Winner, Winner of Top Chef Season 9), and Chef Shaun O’Neale (Master Chef Season 7). In addition, ChefDance and Postmates have joined forces to present their “Eco Friends Dinner”, featuring an exclusive screening of National Geographic’s Okavango Wilderness Project with Producer Amy Berg, complimenting the curated plates of Viale Dei Romani’sCasey Lane. In collaboration with Sysco, ChefDance presents the “Phenomenal Women Dinner in Entertainment, Technology, and Philanthropy” Saturday evening alongside Sqirl chef Jessica Koslow, as well as a Live Garfield performance. Sunday will spotlight Chef Paul Qui, James Beard Winner, and Winner of Top Chef Season 9 Houston, as well as keynote speaker, and founder of Future Generations Now, Skyler Griswold, followed by a special guest performance by Feist. Master Chef Shaun O’Neele will also join in the celebration of Food, Film, and Music, Monday evening. Tuesday Evening will celebrate the evolution and history of Hip Hop, featuring an exclusive performance by the world-famous Wu-Tang Clan to close out the 16th annual ChefDance. Future Generations Now will serve as the official charity partner for ChefDance 2019. The charity provides global services and creates a positive environment for future generations to implement social impact in communities. Deets: The Sundance Film Festival (Utah) brings the most original storytellers together with the most adventurous audiences for its annual program of dramatic and documentary films, shorts, New Frontier films, installations, performances, panel discussions, and dynamic music events. Since 1985, hundreds of films launched at the Festival have gained critical recognition, received commercial distribution, and reached worldwide audiences eager for fresh perspectives and new voices. Year after year, the Festival pursues new ways to introduce more people to the most original and authentic storytelling. This year's program will be posted here! Hint For The Average Socialite: The 2019 Sundance Film Festival pass and package sale is live now! Access the sale here. - Book your #Sundance 2019 lodging on their site!